In truth, as I say every year, we love getting the year's news from friends, old and new, and we are enjoying the xmas newsletters as they start to trickle in. It's a pity there are just not enough days in the year to catch up with everyone on a more regular basis. I guess it doesn't help when everyone is spread all over the countryside. Cycling. Netball. More of the same in 2008. Not much happened the rest of the summer holidays. Alison had to keep her 'glued-together' hand dry for a week - lucky for her the weather kept us away from the beach for the duration. Marc then dislocated his shoulder in the surf, so that cramped his style for a bit: then he went back to work. I tried to "rest" in order to get better and find the aerobic capacity to ride a bike again. Caitlin slept in a lot and made it her goal to stay in her pjs all day if possible. 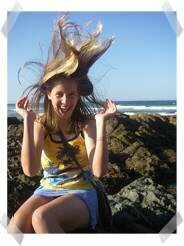 Alison went to a surf day camp for a week, and learnt to stand on a surfboard and jetty jump. Zoe read a lot of books. 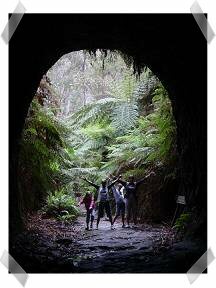 Then it was back to school time, with the girls in Yr 9, 6 and 3 respectively. 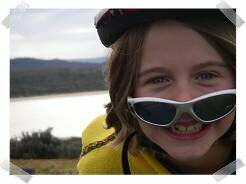 Time then to start focusing on bike riding - specifically to train up for the 2007 NSW Big Ride. We knew we were a bit underdone with the training last year, so we upped the ante with some bigger training rides. 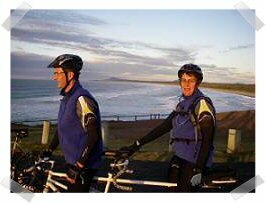 We did an overnighter Grafton-Yamba return (60+ km each way) and some 60 plus km ones around Coffs.. and Marc and I started getting up at ungodly hours on Saturday mornings to go into the Coffs Community Rides. A 6.30 start means a 5 am get-up, whether we ride in on our road tandem (which,yes, we do) or drive in (meaning loading bike/s on and off cars). Anyone who has known me over the years will, after they pick themselves off the ground, realise now that leopards can change their spots after all. We did the Big Ride with ease this year, thanks to the better training, and the fact that it was a bit underdone with the 'kilometreage'. Funny how you can reach the stage of thinking that 40 ks or under in a day (two days running) is next to nothing. "Pffft. We do that before breakfast on Saturday mornings!" Since then Marc and I have kept riding on a regular basis, through winter, with the Saturday morning rides (25-30 km, followed by coffee/breakfast and a chat) becoming a regular feature of our week.. I've seen more sunrises this year than I have in the rest of my life, and riding 70-80km (if we ride from home and back) before 10am is almost de rigeur! 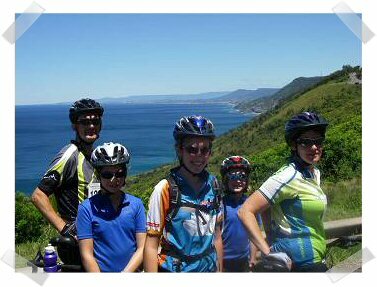 We became more involved with the Coffs BUG (Bicycle User Group) and I'm now in charge of updating the BUG website, plus I also have some new friends to go riding with! Marc and I now have single road bikes, and so have been getting out on them here and there as well. 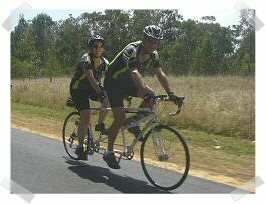 On our road tandem we did the first ever Coffs BUG 100 miles in a day ride - from Brooms Head to Coffs Harbour in early October - which was not without its dramas, but we finished nonetheless, and are all signed up for next year's! 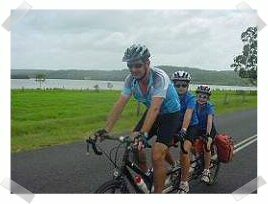 Back in June we bought 'me' a new tandem (a Cannondale) and we've since sold both of our 'first' tandems on to other Coffs families. The girls had a rest from the riding for a while, but we'd pulled out the tandem and triplet again to train up for the Sydney to Gong ride (90km) in early November. We also did that pretty easily- albeit sedately with leisurely breaks to admire the scenery and the glorious weather we were blessed with after a rainy start. Meanwhile, backtracking to the first half of the year, netball was taking hold - with Alison in the first ever (and only) Woolgoolga Netball rep team (12s) and Cait continuing to play rep for Coffs.(14s). Lots of running around to extra training sessions..ie. Mum's taxi getting a flogging. The rep season culminated with the 3-day State Age (in Wollongong this year) at the end of term 2, and, as veterans of the two previous years, we warned Alison that little tinpot Woopi Netball association had Buckleys of repeating the success Cait's team experienced when they won the same division two years earlier. If they came half way through the 24 teams in their division, it would be a Huge Achievement. So, what would we know? The team (down one player even, through injury) astounded all and sundry to come through and win Division 3 under 12s. Just a wee bit of EXCITEMENT and adrenalin involved there. Plus a small triumph for "grass roots" netball. Capping it all off, Alison was (later) awarded the Most Valuable Player for her rep team, so that was icing on the cake. 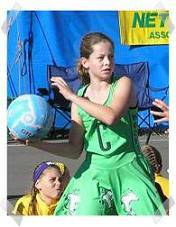 She's a good little netball player - a Duracell bunny in lycra netball gear. It's exhausting just watching her. She and Cait also played 'club' games at Woopi, and helped with coaching FunNets and Nettas. Alison's junior team came through with an upset win in the GF (and Cait's team came runners up in their GF), so much success in the netball. Zoe played Nettas again this year, but is ready raring to go in a Junior team next year. I've seen enough of the inside of a netball clubhouse/canteen to last me the rest of my life.. and so have pulled the pin on being Secretary. I'll still do the website and handbook next year, and, as Caitlin intends to coach a junior team, and Marc intends to coach Cait and Ali's proposed Intermediate team next year, I guess I will still be up to my ears in netball in 2008. Both of them will probably be on the rep teams again, so another frenetic rep season and State Age to look forward to at the end of June. And Marc is playing netball ! In a social summer twilight comp in a mixed division. He figured he needed to actually play the game if he was to have any cred as a coach or umpire. No netball for me, though, thanks.. it's not the game to take up in one's 40s if you have an iffy back, and lack of team sport experience, like I do. Apart from the bike-riding and netball?.. Well, things have changed on the work front with things reaching critical mass.. so to speak... early in the year. Ultimatums were made both at home and at work and the end result has been that work has seen fit to curtail most of the overseas work, seeing that they really need someone to manage things from the office anyway. We have consequently done so much more together (as a couple and a family) - probably more during the rest of this year than we have in the 10 years since we came here and he started this job and all the bloody away work. He is fitter and healthier, since he gets to play his Touch pretty much every week now, plus all the bike riding. We are all much happier being a 'normal' family for a change. I've done more exercise this year than ever before as well - with one or two swimming squads a week, and doing weights once a week with a trainer, on top of all the bike riding. Unfortunately my appetite (for crap food) has increased accordingly, while my willpower hasn't, and so I have no happy news on the weight loss front.. So much for resolutions. Maybe next year I can change those particular "leopard spots". Presumably I'm a bit healthier and fitter, even if I'm still plagued by a niggly back. The girls have done well again at school, so I'll shout about it while I can. Alison got Dux of her primary school (so of course we are very VERY chuffed!) No pressure on Zoe, huh! - though she picked up a class academic achievement award again, plus a special Library award, so she is doggedly on track for the trifecta. The wonderful teacher she had this year thanked us in Zoe's report for having had the privilege of getting to teach all three girls (while I profusely thanked her (and providence) for all my girls getting to have her as a teacher.) It seems we are leaving a Schmidt legacy in reputation, and on the school honour boards - in sport as well (Ali was also Senior Girls Swimming champion) - so it's nice to know they are leaving their mark on the world in a small but positive way. Cait did well in the first semester this year, but crashed and burned with a couple of subjects this end of the year. 'We' don't like Maths, and we get 'issues' with some teachers, and thus end up with a report that looks like it is referring to different students, depending on the subject - either totally brilliant (English) or talkative and easily distracted (Science). Go figure. Perhaps she is 'normal' after all. Next year will be interesting.. with Alison starting high school AND turning 13 ! OMG, like, two teenagers in the house ! They have very different personalities, but no doubt raging hormones will make for an interesting dynamic. Throw in a peri-menopausal Tracey, and Marc may yet start secretly requesting more overseas work again. Ali has dabbled in music - having taken up recorder and flute through extra-curricular opportunites at school - and she got to play in a combined schools recorder ensemble at the Opera House in June. We sent her down in the plane, and Grandma took her to the rehearsal, and concert, which by all accounts was totally brilliant. She plans to go again next year, and Zoe, also doing recorder, is lined up to go as well. I'll be checking it out this time too! Payback for the sound of recorder practice in the house for the six months leading up to it. Zoe ditched the ballet and took up tennis lessons this year... maybe Mum's genes will prevail in that arena. I played Ladies Midweek again, but I won't be setting the world on fire with my tennis any time soon. Zoe and Ali still do an hour swim squad once a week, and Zoe just grows in strength and confidence before my very eyes. This summer she's finally decided she's brave enough to go 'out the back' on her boogie board, so we are looking forward to a fun time in the surf over the holidays. 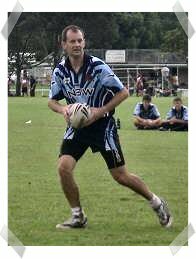 Marc (in Mens Over 40s) and Cait (in the mixed U15s) played in a NSW vs QLD state of origin Touch tournament. Marc's team had a win (and he reminds me that he scored the winning try in a 3 on 3 'drop off' or some such...!) and he will go through to play in the mens over 40s Australian team against NZ next March. He plays with Cait's team (now in Opens) on Wednesday afternoons (as well as his own over 35s team) and he is training her up to be in the right place at the right time to score tries. It's pretty cool that this is something they can do together. I am still fiffing and faffing about what to do with myself in terms of work. I've been doing a bit of writing (blogging) this year in an attempt to get better at it and perhaps find some means of being rewarded in cold, hard cash, but I've not managed to find my niche yet. Nothing whatsoever has happened with the house extensions this year. Must get onto it and try to fit it in around the bike riding and netball in 2008. We are spending Christmas Day at home this year, then heading to Tea Gardens for two nights where Marc's mum is still recovering from a knee operation. We'll come back and enjoy a bit more of the sun, sand and surf just ..over..* there*... before heading to the Blue Mountains for a week (via family in Sydney) on the 5th, with hopes that the weather and fate will allow us our canyoning this time. We'll then have another leisurely week at home before Marc heads back to work, and the whole merry-go-round starts again. Anyway... wishing you all the best of this mad, mad season, and for a great year in 2008. It was great to catch up with a few old friends this year (through the netball, and the bike rides even - who'd have thought!) Hopefully we'll do so again next year, as well as continue to see more of new friends we've made in 2007!